During boot camp, recruits will have their photos taken with their platoon as well as individually in the "dress blues" uniform. A video of graduation will also be produced, and that video will include footage from each battalion. 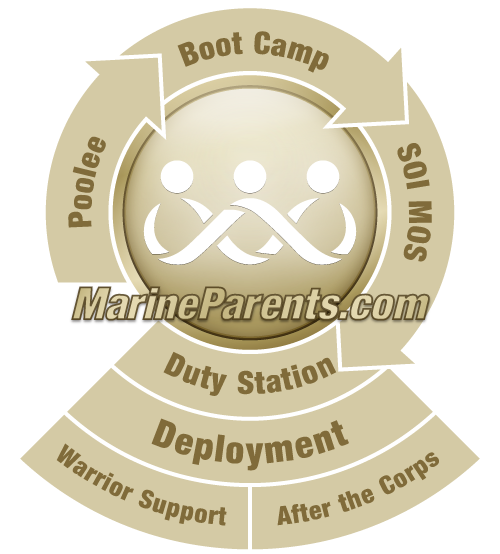 Both Parris Island and San Diego offer these services. Your recruit will be given an opportunity to purchase the photos as well as the video. They will also be given the opportunity to order a yearbook, and at Parris Island, that will be the only time the yearbooks are available for order. Individual photos will be given to the recruit prior to Family day, but will not be mailed home. Recruits who miss photo day for any reason or recruits who must have retakes will have those photos mailed to them. When a recruit has his or her photo taken and then has to change companies because he/she was set back in the graduation cycle, the photos are sent to his or her new platoon. As of 11/1/13, "Good-To-Go-Video" no longer produces the Parris Island graduation video. From 11/1/13 onward, Parris Island Photography will be producing the new Parris Island graduation video,"Earning The Title." To order, please click here. For videos made prior to 11/1/13, you can order them here. Only recruits can order yearbooks. Family members cannot call and order one even if their recruit is in boot camp. Recruits will be able to order a yearbook on training day (TD) 26. That is the one and only time that they will be able to order a yearbook. No orders will be taken after that date. If you would like to have a yearbook please send your recruit a reminder in a letter (prior to TD 26) to order one. Recruits, when ordering the individual "dress blues" photo, may also order a yearbook/graduation book as well as a slideshow DVD. This DVD is different than the graduation video. It is a slideshow of candid still shots taken of the recruits throughout all phases of training. These should be ordered by the recruit during training, but you may order copies of them afterward through the Marine Corps Community Service website or by calling the yearbook office at (619) 296-3840. The yearbook office keeps records for two years. For books older than four years, you can contact the MCRD Historical Society at (619) 524-4426. The San Diego graduation video, Pass in Review is produced by David James Productions. The video includes the Eagle, Globe and Anchor ceremony, the Moto Run, Liberty formation on Family Day and the Graduation ceremony. Also included are the platoon videos which they so generously provide for parents to view during boot camp. If ordered during boot camp, the Pass In Review video usually arrives within 2 weeks of graduation. Yearbooks and/or the slideshow DVD can take up to four months to be delivered. However, as a proud Marine mom from Michigan proclaimed, "They are worth the wait!"